We all know interviews can be quite daunting and nerve wracking. But here are 5 useful tips to ensure that you land your dream job! There nothing like going for your interview and not knowing anything about the company or the person who you are being interviewed y. So be PREPARED. Do your research. Know a few facts about the company and ensure you understand fully what the role entails. It my sound obvious but it is key to be punctual to an interview, if not it only reflects badly on you. If its in a location you’ve never been before than plan a route, and alternate routes incase your first one doesn’t work out. 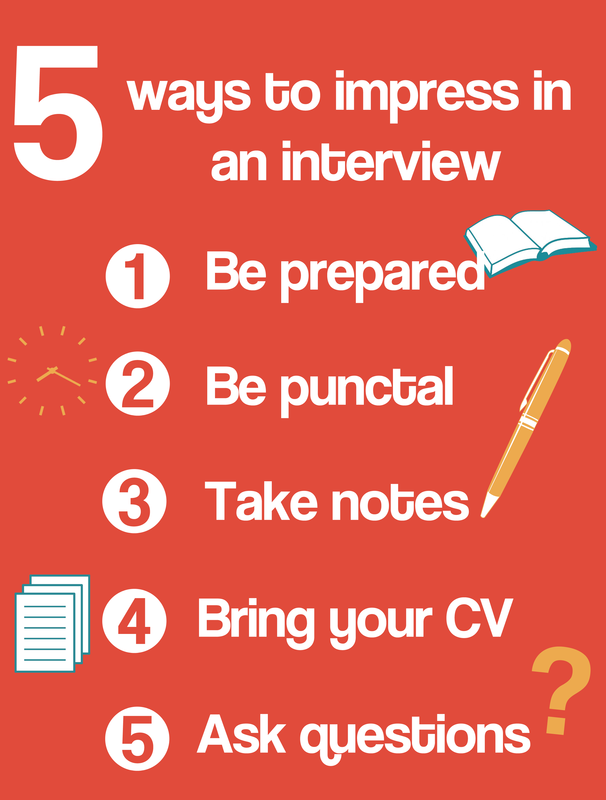 Aim to arrive around 15 minutes early, this will not only show your great time management skills but will also give you some time to collect your thoughts and prepare yourself for the interview. Write down anything you may find important during the interview. It could provide great references after the interview, and it also shows your interest in the role you are applying for. It’s more than likely that your interviewer will have a copy of your CV already, but bring one or two along anyway. They can be helpful when your referring to past experiences/achievements. An interview is not a one way street, so have some questions prepared before hand, or ask some that come to mind throughout the interview.